It could be used as crossbody bag, handbag and shoulder bag. Big enough to hold iphone7 plus,keys,cosmetic and other samll items. Cute rabbit style with golden straps makes the bag stylish and it's an awsome gift for your girl friends. Dimension: 4.73"*7.08"*2.36" (12*18*6 CM) Shoulder belt: about 120cm/47.24"
Could be used as handbag,shoulder bag or crossbody bag. 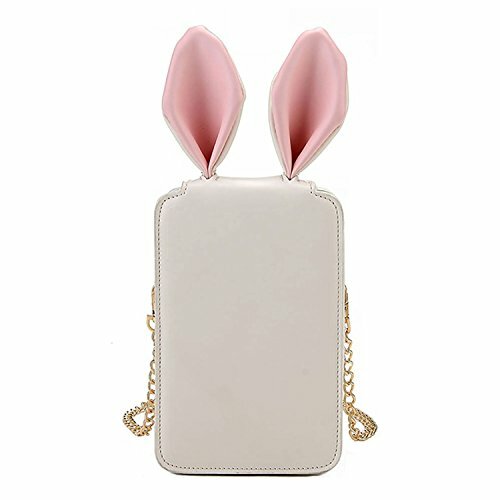 It's unique cute rabbit design will be the perfect addition to any true fashionista's wardrobe.